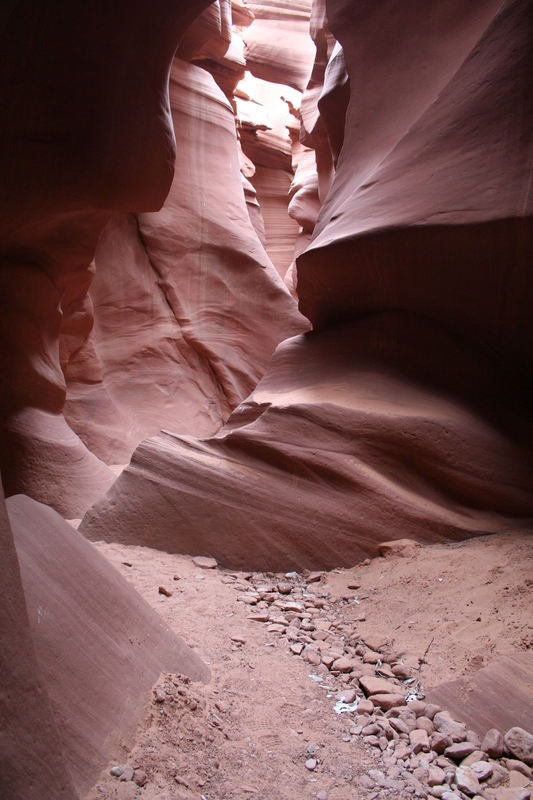 "Hasdeztwazi" is the Navajo name for "The Corkscrew" - a renowned slot canyon that has attained some notoriety because of the 1997 flash flood that killed several tourist. 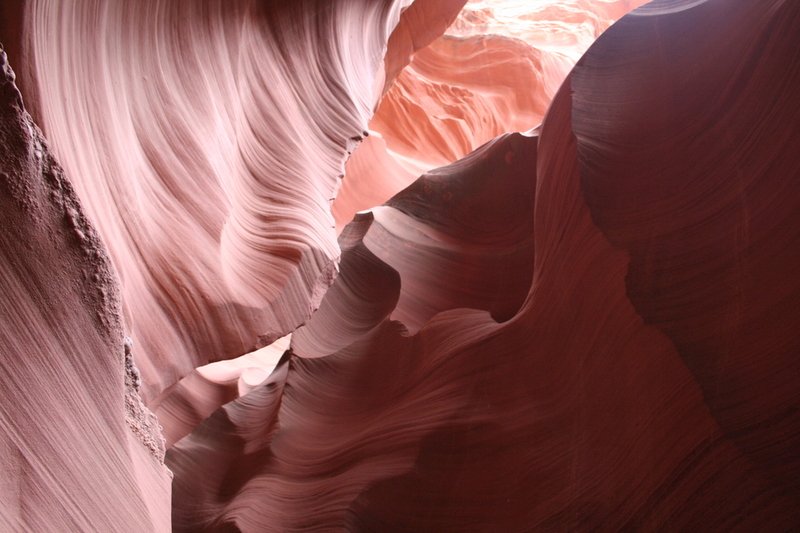 The history presents some sobering facts when one visits Antelope Canyon. Maybe the element of danger adds to some of the appeal? 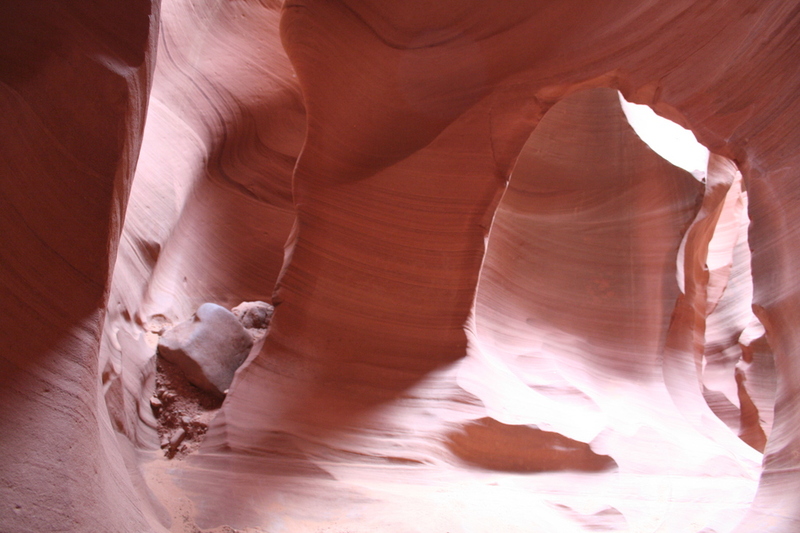 After visiting Upper Antelope Canyon earlier in the day, I cross Hwy 98 and pull into the parking lot located on the north side. It's almost noon on a Sunday in February as I walk up to the admission booth. The Navajo Guide at the booth explains to me that the cost will be $15 plus $5 for a Navajo Lands Permit. Since I purchased the permit earlier in the morning, the cost will be $15. I'm also asked to sign a release form. I'm guided by Brandon. He explains to me as we walk to the entrance of the slot canyon that I can take as much time as I like provided I leave the canyon by closing time slated for 3:00 pm that afternoon. 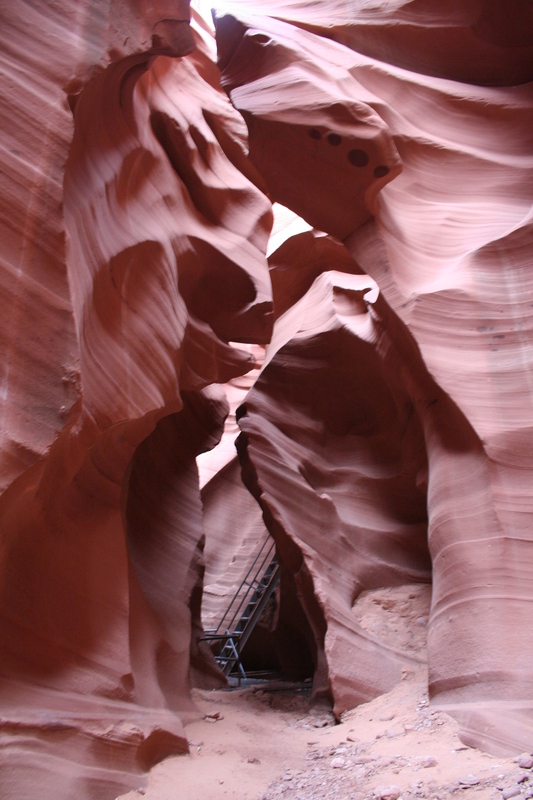 Brandon explains that there will be series of ladders leading down into the slot canyon. He also explains the layout of the canyon and I can't stop chuckling inside because it reminds me of a Monty Python sketch (the canyon is thin at one end, thick in the middle, and thin again at the other end). I'm sure that's not a theory but it's also the last I see of Brandon today as he heads back to the admission booth. 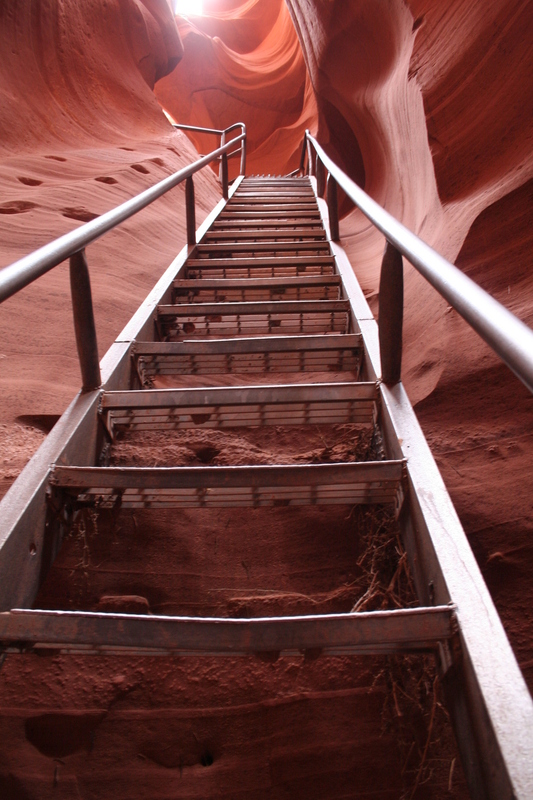 I'm on my own as I wind myself down the series of small ladders and into the narrow labyrinth. 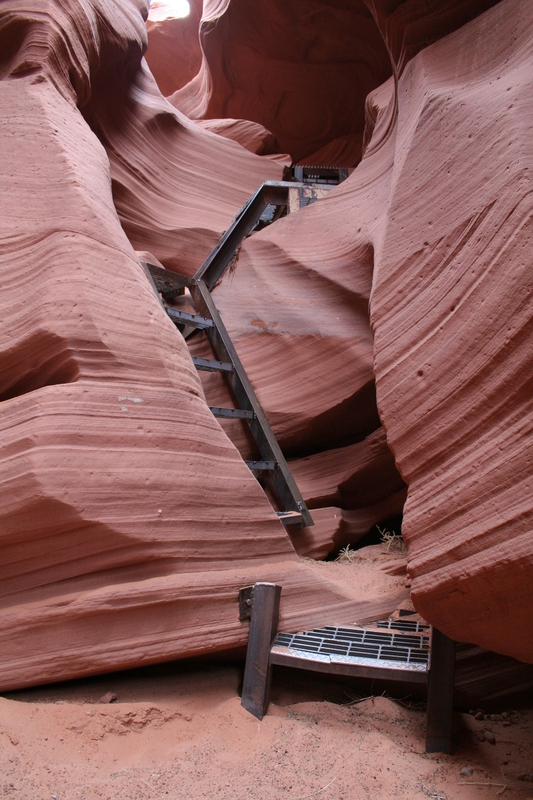 The passage way is a tight squeeze and some of the required maneuvers border on being agile. You alternate between darkness and light. 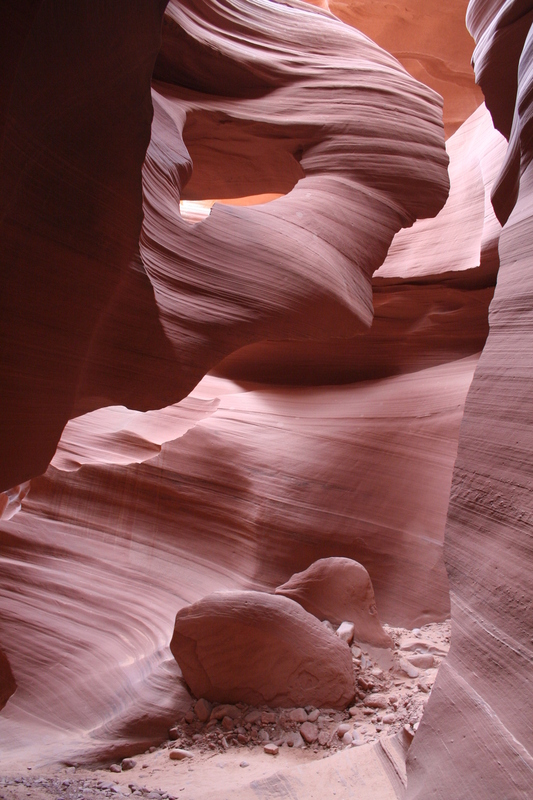 There's a calm stillness within the slot canyon. This is cool! 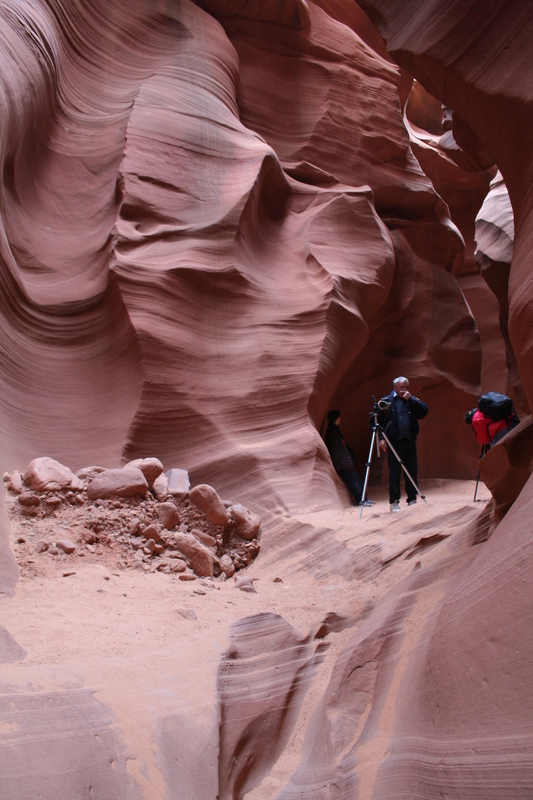 I soon pass the only people I'll see within the slot canyon - a couple of photographers setting up to capture the famous "Hole-In-Rock" formation. 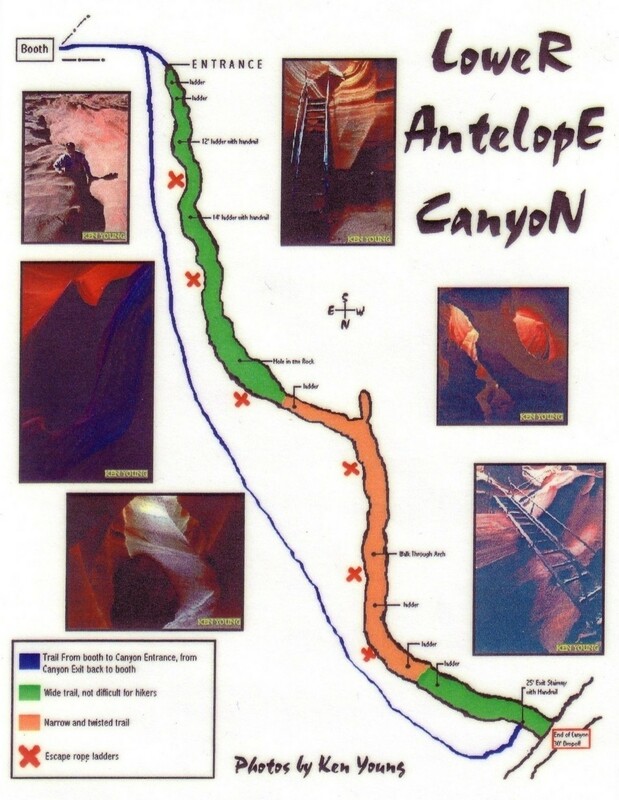 I start to think about the geology lesson given by Delvin, my Upper Antelope Canyon Guide. 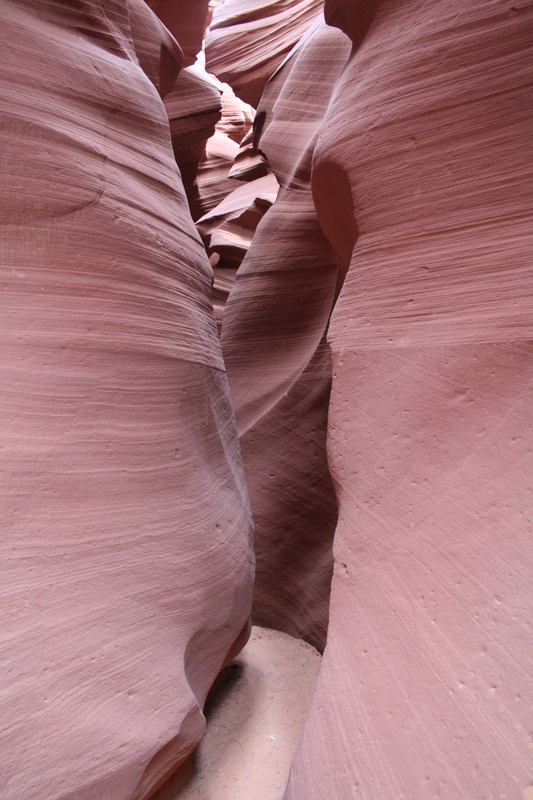 As I examine the sandstone walls, I can detect evidence as to how this canyon was formed. 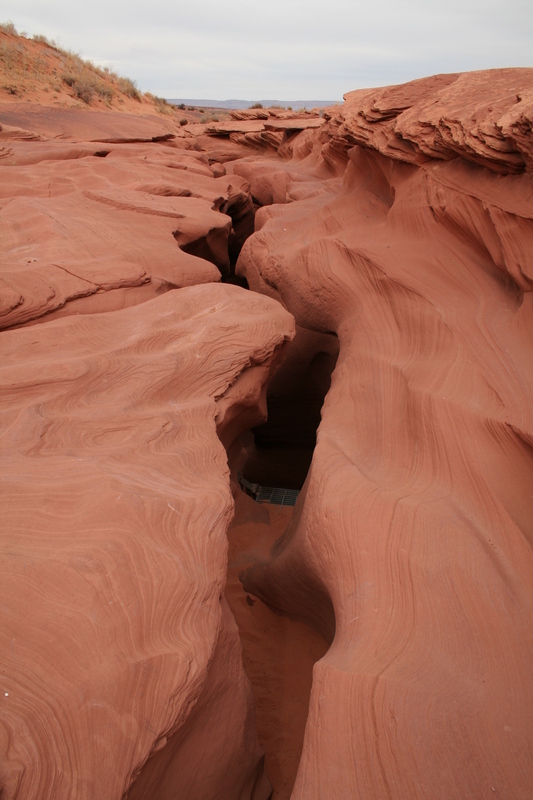 Unlike ordinary erosion in which rocks of differing composition and hardness are chewed away at various rates forming a V-shaped channel, the uniform sandstone found in this area is removed straight down. Once a channel is first formed, all water will funnel into the channel and continue this downward removal pattern. 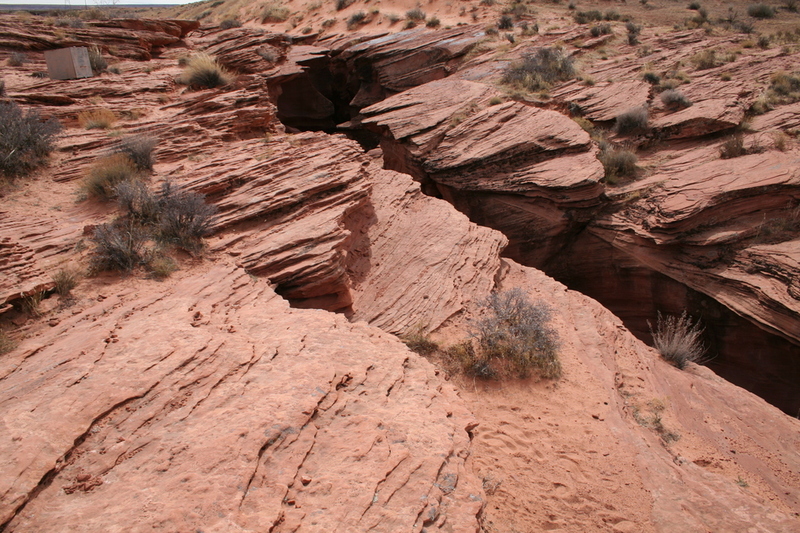 A single storm is capable of removing a foot or more of sand from the canyon. 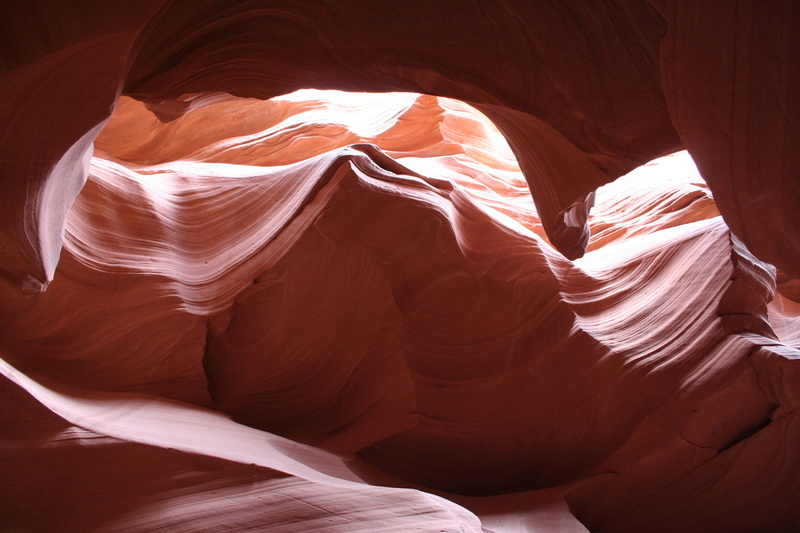 The Lower Antelope Canyon measures 150 feet high and ranges in width from about 2 to 30 feet. 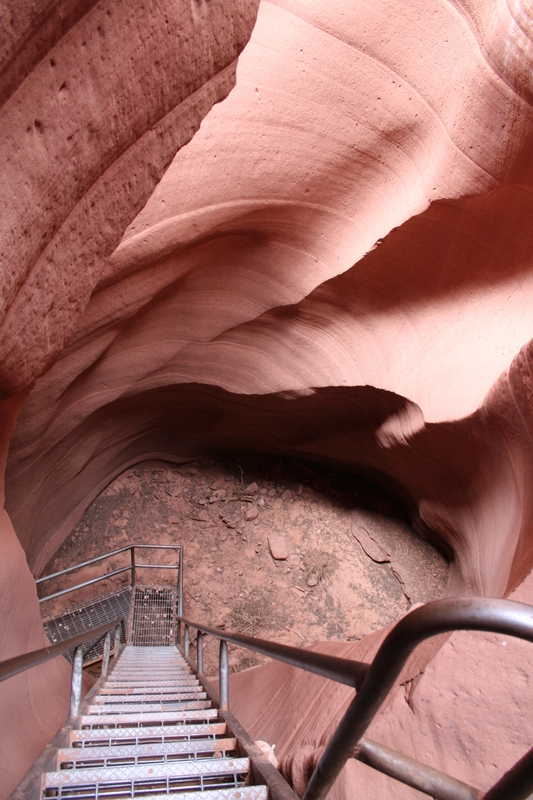 Viewed from above ground, the canyon may only measure a foot or two across. 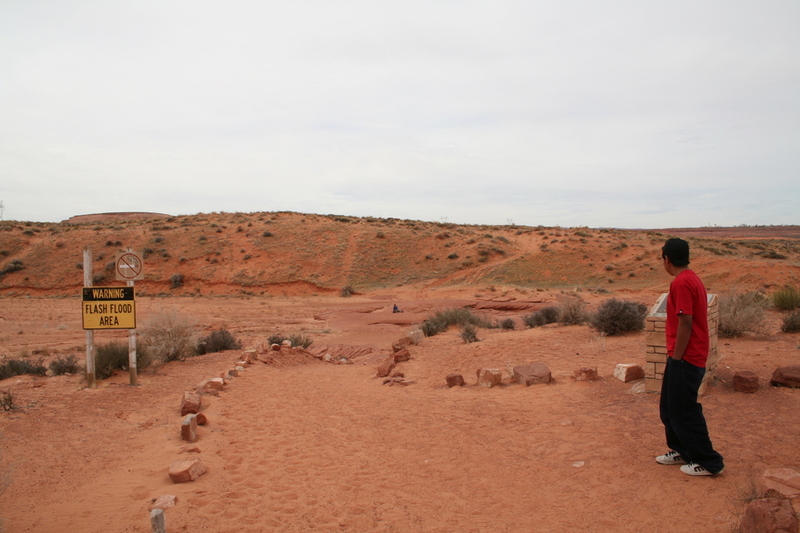 I soon find the equally famous "Walk-Through-Arch" formation. A series of drop-offs soon follow. 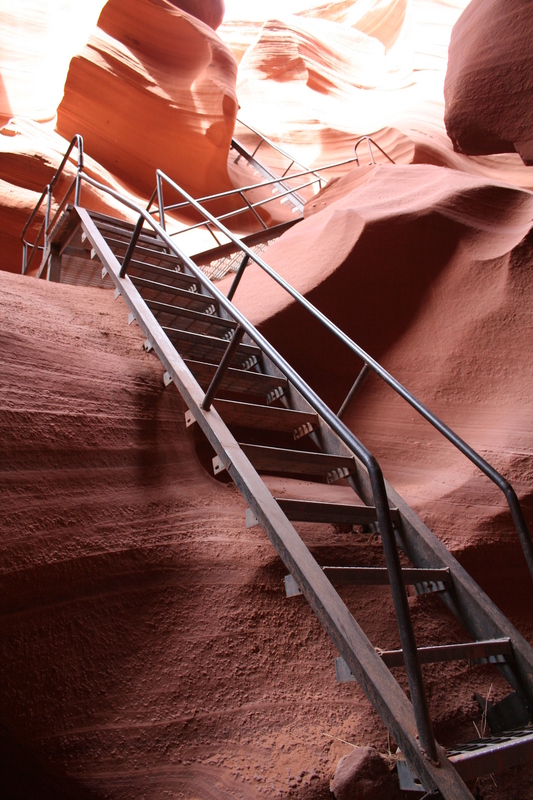 Strategically placed ladders allow passage. I snap off photo after photo after photo as I make my way towards the north end of the slot. I spot more ladders heading straight up. Curious and not wanting to leave the canyon just yet, I continue along the slot until I reach an impassable drop-off greater than the advertised 30 feet! 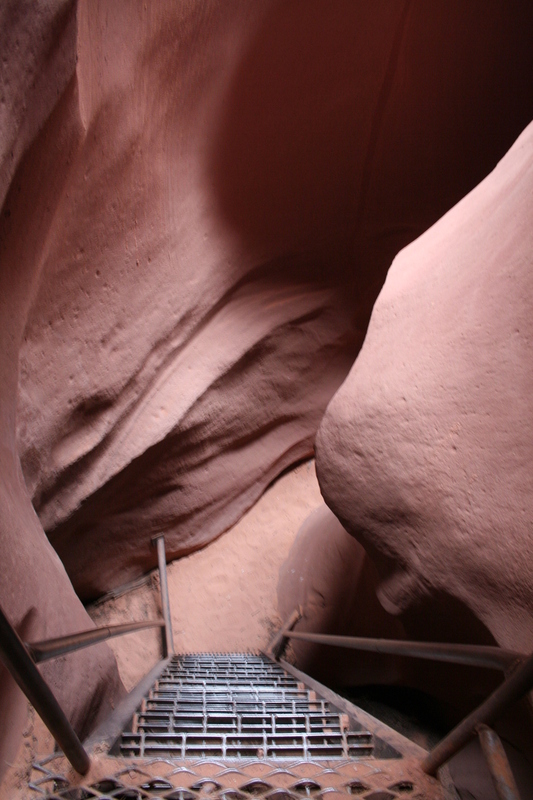 Realizing I'm at the end of the canyon, I wander back for some last shots before ascending the ladder up to the surface. I take the surface trail back to the parking lot and admission booth. 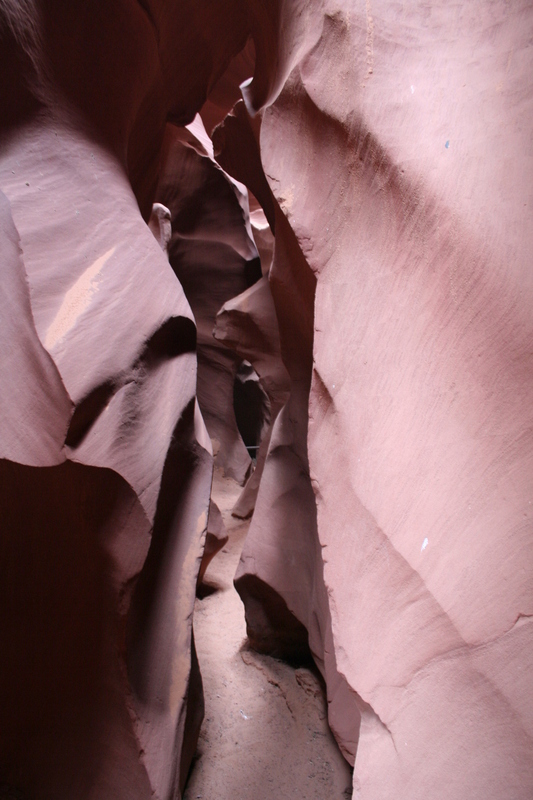 Heading back up the slot canyon was an option given the lack of traffic on this day. 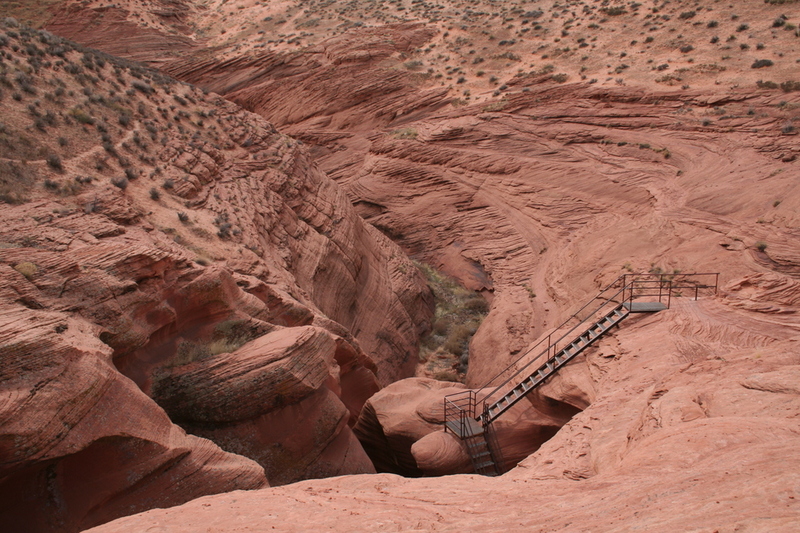 The "Hasdeztwazi" is another must-see for anyone appreciative of the natural wonders in Arizona. The "Tse bighanilini" located across the highway is unique in its own way. I can't recommend one over the other - they're both spectacular. 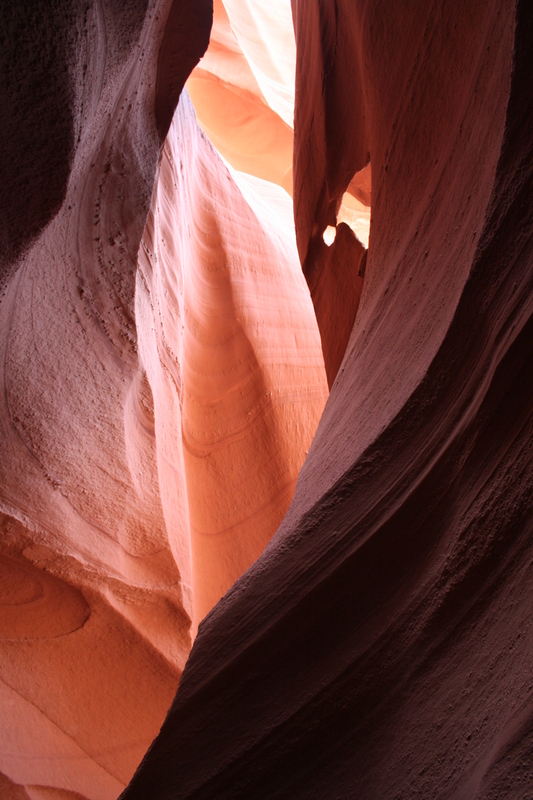 There's also the haunting history associated with Antelope Canyon can not be conveyed by words, but can only be felt by visiting. Enjoy! Tour permit info & FAQ link in directions. 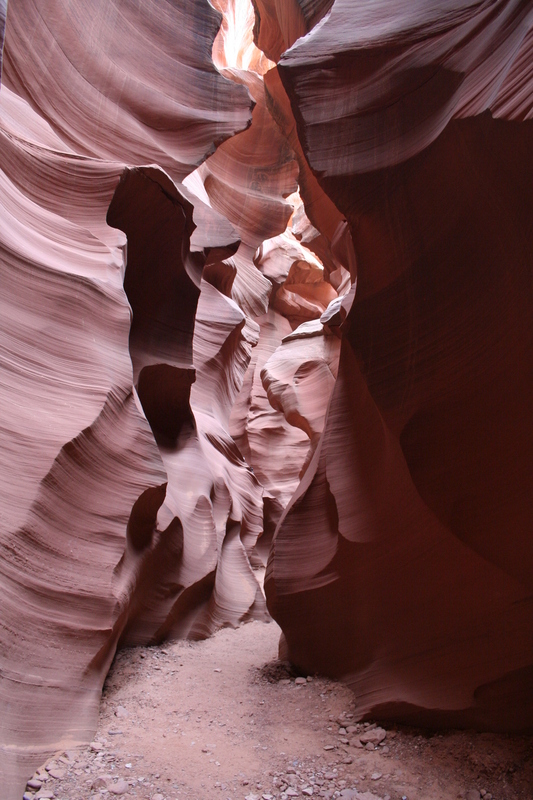 Antelope Slot Canyon Tours nice FAQ! From Phoenix: Take Hwy I-17 north 146 miles to Flagstaff. From Flagstaff, take Hwy 89 north 133 miles to Page. From Page, take Hwy 98 east 3.3 miles to the intersection with Antelope Point Road (GPS coordinates 36o 53.848'N, 111o 24.363'W). 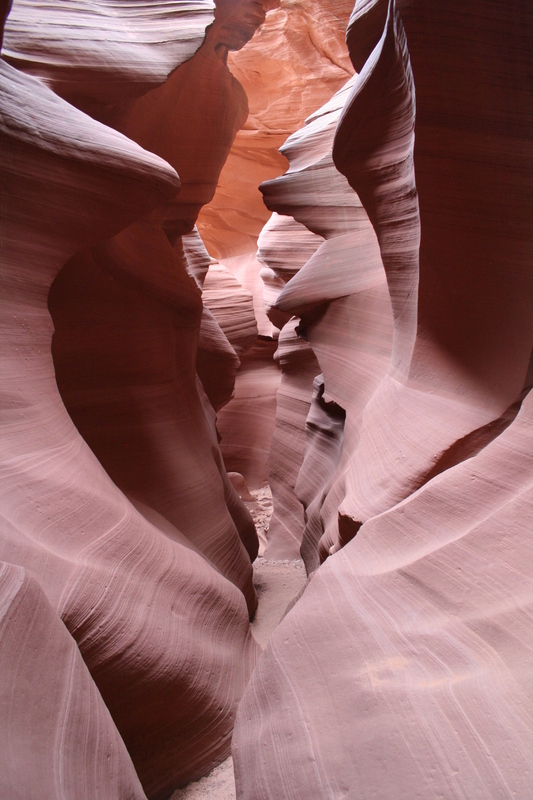 Turn north onto Antelope Point Road and the parking lot for the Lower Antelope Slot Canyon will be on the west side (north side of Hwy 98). 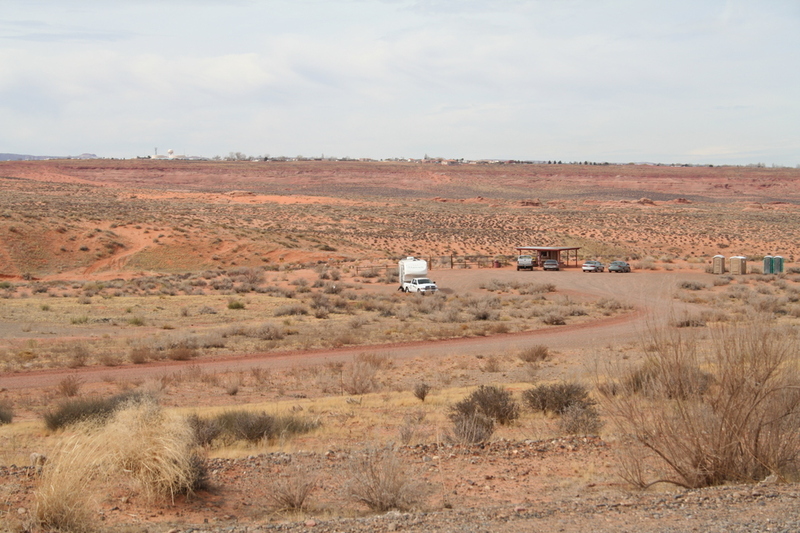 If you pass the Navajo Generating Station, you've traveled too far! 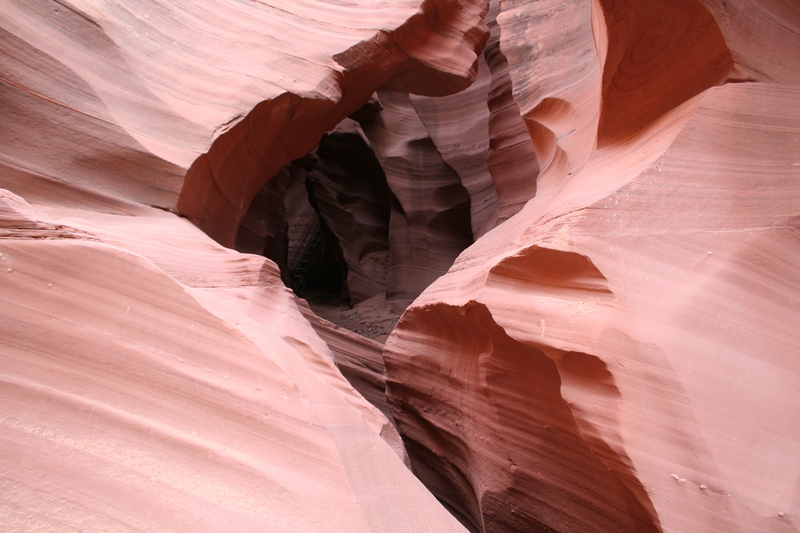 My GPS noted 296.8 miles traveled from my home in Ahwatukee to the Lower Antelope Canyon trail head parking. Travel time was just over 5 hours. 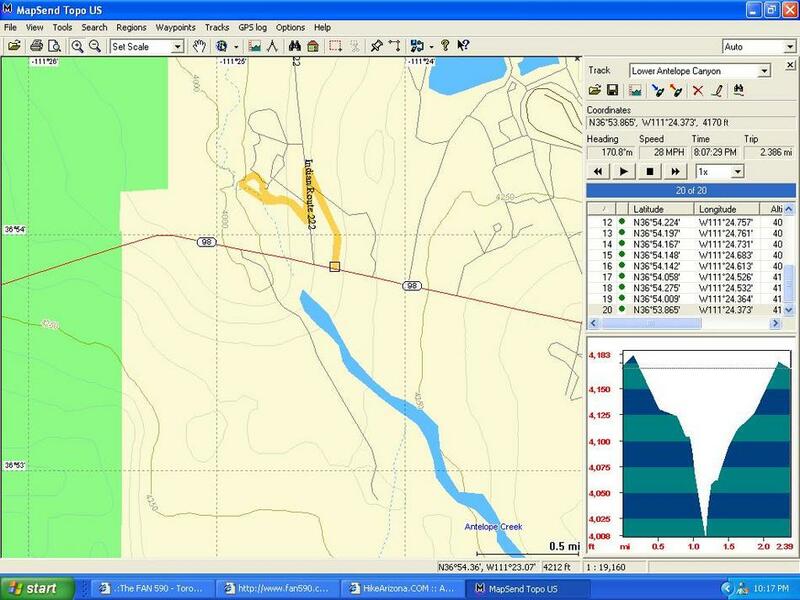 GPS coordinates for the entrance of "The Corkscrew" are 36o 53.865'N, 111o 24.373'W.